Do you own a slow cooker? If you do, the purpose of it is to make your life easier, right? Well, what if I told you that there are slow cooker hacks out there that can make your life even easier? Check out these slow cooker tips and tricks that are super simple to start doing today! 1. Use a slow cooker liner. If you’re tired of spending hours and hours washing your slow cooker, buy a slow cooker liner. These are designed to put inside of the slow cooker so there’s no mess. You just take the liner out and throw it away. Easy peasy. 2. Line the slow cooker with aluminum foil. Another slow cooker hack is to line it with aluminum foil so that the food cooks more evenly. This also makes for a super easy clean up. 3. Cook simple items in the slow cooker. Most people think that slow cooker recipes have to be a huge meal. It doesn’t! You can steam veggies in the slow cooker, “bake” a potato, and even cook a spaghetti squash from within. The opportunities are endless. 4. Low setting works wonders. Most people get nervous that their food won’t turn out right if they don’t put it on a high setting. However, a low setting can cook food over a long period of time and is great for while you’re at work. If you set it on high, it cooks faster and may be overdone by the time you get home. 5. Don’t add in noodles right away. Noodles aren’t the best for slow cookers because they get really soggy. To avoid this, add noodles in last and only let them stay long enough to heat up. 6. Baking soda is a great slow cooker cleaner. As mentioned before, cleaning a slow cooker is a pain. Try using a baking soda paste to make cleaning a little easier! 7. Keep the lid on your slow cooker. No peeking! Every time you remove the lid on your slow cooker, it takes several minutes for it to return to the proper temperature. Don’t remove the lid unless you have to! If you need to add something, wait until closer to the end. 8. Enjoy its versatility. Slow cookers aren’t just for cooking roasts. You can make breakfast, lunch, dinner, and even desserts. Get a little creative with your slow cooker by switching up what you make each day. Craving slow cooker recipes? Check out my posts featuring Slow Cooker Cinnamon Raisin Bread Pudding, Slow Cooker Lasagna, Slow Cooker Verde Chicken Chili and Slow Cooker Spinach & Feta Quiche. Do you have slow cooker hacks to share? I’d love to hear your tips and tricks! Thanks so much for the Slow Cooker Hacks! It is always great to get extra tips to make the job easier! I love slow-cooked meals. Thanks for the tips. 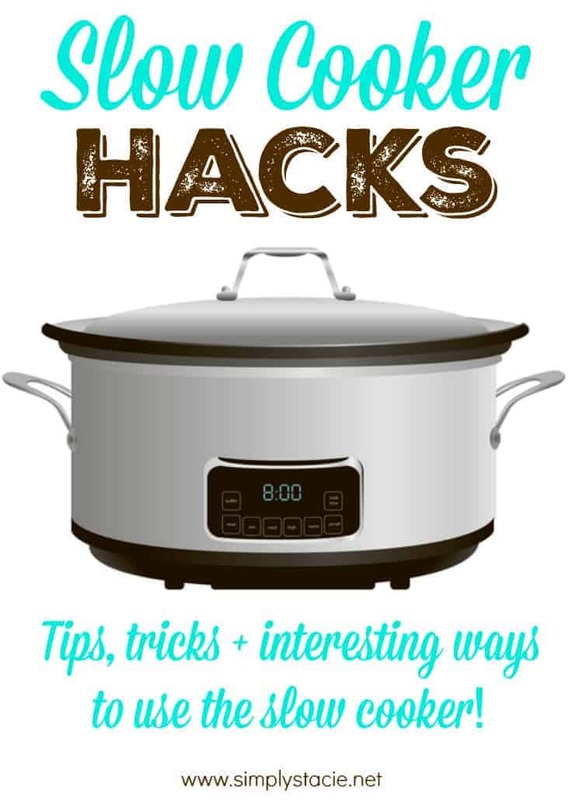 I often use my slow cooker and I will use some of these hacks. Some great tips! I didn’t know there was such a thing as slow cooker liners. I must find some since trying to clean it is the reason I don’t use it much. lots of great tips! thank you! love the liner ideas! I place a piece of aluminum foil in between my pot and lid so I don’t lose heat. Thanks for these – I finally got one and will use these!! Now I’m off to get a recipe for Loaded Baked Potato Soup!! Or Clam Chowder.. depends on the presence of clams in my pantry!! I love my slow cooker especially in the winter. It’s not a big one but for 2 of us it is great! I try not to take the lid off unless necessary. Your tips are great and I want to thank you for these tips because I didn’t know they made the slow cooker liners but as soon as I read this I went and bought them which will save me a lot of time and frustration.